World War II veteran Anthony ‘Andy’ Andriola, a Division Medical Supply Staff Sergeant, earned a Bronze Star for his efforts during the Battle of the Bulge. The Ravine Street resident was ‘somewhere in Belgium’ in mid December 1944 when the Germans attacked. Hitler’s goal was to split the Allied forces and seize the port at Antwerp. The month-long Battle of the Bulge involved more than one million soldiers. American losses were 81,000, including 23,554 captured and 20,000 killed. Before scouting a site for the medical station, the sergeant would take a map and view railroad tracks, roads and rivers in the area, and figure a way back to his unit if he were isolated. “Me and this fellow Carson and a truck driver, Yablonski, We went up to this little town and we set up for medical supply …When we set up, I get a phone call – they need the truck. So I said I’ll send you the truck but I need one guy here to stay guard all night. I’ll leave Carson there and send Yablonski back. “The following night, it must have been about 5 o’clock, 6 o’clock, it started getting dark. We could hear these noises. We could hear these tanks grinding, going down. So, Carson says to me, ‘Andy, you had basic training, you know more about it than I do, you go out there, you better see,’ he said, ‘because you said it don’t sound like our tanks.’ So I went out, crawled outside to see, and sure enough, there was a German tank! “So, we went about maybe six blocks, until we couldn’t hear those tanks anymore. We picked out this old house – the top was all bombed off but the basement was there and we went down in the basement. The soldiers buried themselves deep inside the potato bins and hid there for three long days. “I couldn’t eat potatoes for six or seven years after that,” Andriola says. “And while were in the basement, we could hear German troops talking. After the third day we sneaked out and followed train tracks back to our outfit. As Division Medical Supply Sergeant, Andriola’s battle experience in North Africa and Sicily paid off for the Ninth Infantry during the Battle of the Bulge. He was awarded the Bronze Star for “meritorious service in connection with military operations against the enemy during the period Oct. 1 to Dec. 31, 1944, in the European Theater of Operations. 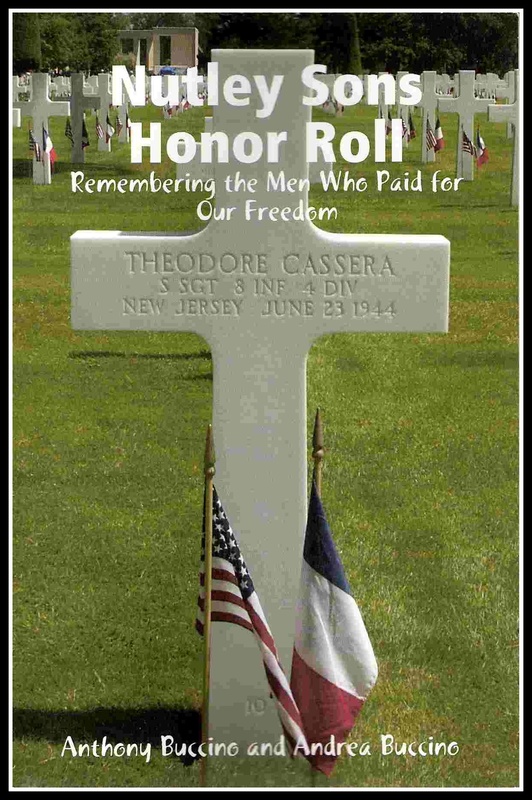 Adapted by Anthony Buccino from Nutley Sons Honor Roll – Remembering the Men Who Paid For Our Freedom, a collection of biographies of Nutley sons who died while in service.